Well one of our sources of inspiration - or what molded us at an early age, was Montessori schooling ~ especially the really fun woody “educational” toys we grew up with… from the sandpaper letters to learn to write, those heinous beads i loved/hated to learn about decimals, the multiplication board had those great little red beads, the satisfaction from tasks like pouring sand and pellets from one container to the other, the trinomial cube, the blue geometric solids (perspective drawing 101? ), and that infamous pink tower… [to kris of BLTD - our tiniest pink cube was the most coveted too! we should make necklaces with that for other Montessori kids who grew up!] So now you know - we were Montessori kids, and i think the impact of Maria Montessori’s genius helped make us the obsessive design lovers we are today. Everything important that I ever learned was from my Montessori schooling. 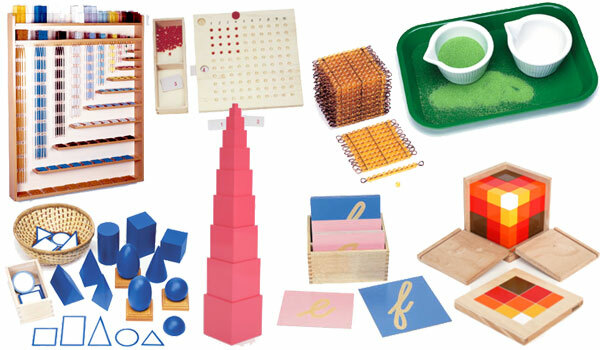 Now I’m a designer, designing a visual identity for a Montessori program, looking for some inspirational imagery. Thanks! Wow how neat is this?! I just finished my Montessori training and am now an assistant and well I am totally in love with Montessori so it is so nice and awesome to hear about people who were educated the Montessori way and the impact it had!!! Wow!!! I haven’t seen that stuff in so long. I always think of my montisori start as something that made me into who I am. I blame the darn beads for the fact that I still don;t know my mutiplication tables at age 22. But your ppoint about their unique design elements is a good one and may well have also molded me into the creative person I am today.